A wealth of information on most of the Greek New Testament---all in non-technical language! This reader's companion series clarifies many of the English words that do not fully capture the meaning of original Greek words. Includes topical word and devotional studies, book studies on most of Paul's epistles, and Wuest's New Testament. 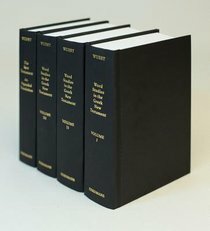 About "Word Studies in the Greek NT 4 Vols"